Tucked away in a deep mountain valley is the village of San Sebastian. 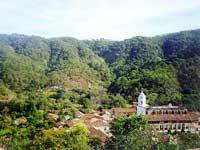 "The town that time forgot" is one of the oldest settlements in Mexico, dating back to 1605. 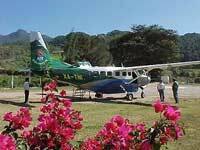 No long bus rides through winding mountain passes here - we'll FLY you from Puerto Vallarta aboard a 13-passenger Cessna designed especially for sightseeing. The short, scenic 15-minute flight offers fantastic photo opportunities and views, and the tour brings an enlightening look into Mexico's past. San Sebastian reached its peak of prosperity in the 1700s, with over 15,000 inhabitants in the area at that time. Today, San Sebastian remains an outstanding example of the traditional ways of living and working in a remote Mexican mountain village. San Sebastian is a living museum untouched by time, and an experience difficult to surpass. Runs: Tuesdays and Thursdays at 10:30AM. Saturday tours are limited to groups of at least 8 people. Includes: Lunch, Soft Drinks, Flight to San Sebastian and tour of the village.